Secretary of Defense James Mattis spent Veterans Day by walking the famed Section 60 at Arlington National Cemetery and talking to the families and friends of fallen service members. Section 60 is a newer part of the cemetery where many of the fallen from the recent wars in Afghanistan and Iraq are buried. David Brown posted on Facebook about how he saw Mattis walking through the section where he was approached by families and friends of fallen service members. According to Brown, Mattis listened to stories about those who were buried there and consoled the families. Mattis, a retired Marine Corps general, himself led many into battle and commanded some of the troops who are buried there. Mattis led the I Marine Expeditionary Force, U.S. Marine Forces Central Command and 1st Marine Division during the Iraq War. Brown mentioned a story where a man told Mattis that his deceased Marine son's hero was Mattis. Mattis replied by saying his son was his hero. 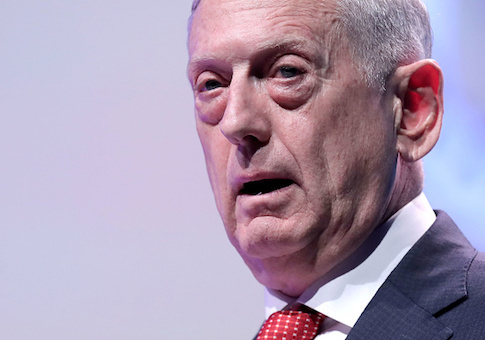 "James Mattis is one of those living legends who transcends politics and ideology," Brown wrote. "His job is his life, and that job is the welfare of this country and its servicemembers. This Veterans Day, I send a special thanks to James Mattis, for not taking today off." This entry was posted in National Security and tagged James Mattis, Secretary of Defense, Veterans. Bookmark the permalink.